As part of this year's 25th anniversary of Texas Parks and Wildlife Foundation (TPWF), we're celebrating the projects that you've supported over the years that are conserving the wild things and wild places of Texas. Thanks to funds raised by TPWF from private donors, public funds were leveraged to acquire the 18,000-acre Devils River Ranch in 2010. The Devils River is the most pristine river in the Southwest. Its crystal-clear waters course over rapids and ripples through rugged canyons to create one of the most stunning landscapes in North America. Now there's a new effort to protect the watersheds of this beautiful river. TPWF also supports the Conserving Texas Rivers Initiative, a public-private partnership that is successfully leveraging federal, state and private funds to keep Texas rivers healthy. These efforts to conserve the spectacular Devils River ensure that future generations of Texans will have the opportunity to explore and enjoy its unmarred beauty. 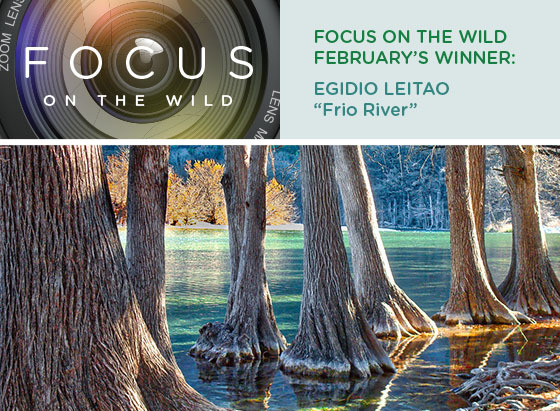 This beautiful image of the Frio River at Garner State Park is the February winner of our year-long photo contest. Egidio Leitao is from Austin, and he and his friends have a holiday tradition of heading to Garner every year. "Unlike during summertime, the park is often very empty at that time of the year and it is our way of starting the Christmas with friends," said Leitao. "We bring Christmas lights to decorate the cabins, and we spend our days hiking, biking and enjoying the quiet scene and weather." And taking beautiful photos, obviously! As our winner, Leitao will win a Yeti cooler to take along on his next state park outing. This month's photo contest theme is the Texas Coast. That could include your favorite beach shot, a coastal fishing image or maybe birding along the coast. To have a chance at winning, be sure your photo fits the theme and is submitted by March 25. Even if you submitted a photo previously, you can still enter this month. Read the contest rules to find out more. Spring is almost upon us, and that means it’s time to go outside and play! And there’s no better place to enjoy connecting with nature than at a Texas State Park. Thanks to TPWF members, we’re able to help provide more and better outdoor experiences for Texans. Check out this new video about what TPWF members help support. From the spectacular acquisition of Powderhorn Ranch along the coast to providing equipment to introduce families to camping, TPWF supports efforts to enhance the state parks of Texas. If you are already a TPWF member, a heartfelt thank you. If you are not a member yet, join today! As a member, you’ll receive exclusive benefits like insider information, invitations to special events and other members-only perks. And, you’ll be supporting TPWF’s work to conserve our state’s wild things and wild places, now and in the future. Help keep Texas wild for everyone.